Infinity Wars #3 review: Who has control? – AiPT! 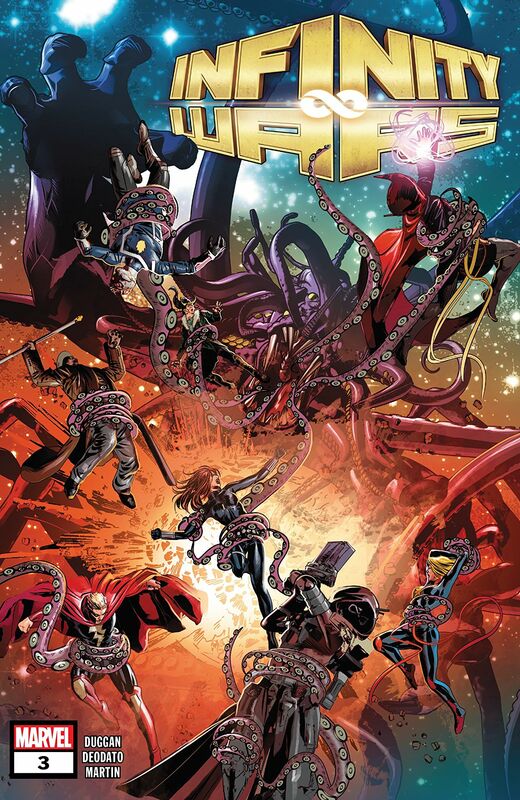 Infinity Wars #3 review: Who has control? Who controls the stones? Who is in control of their own destiny? Who controls Gamora herself? In the end, I think that the centerpiece of the Infinity Wars event will be about control: Who controls the stones? Who is in control of their own destiny? Who controls Gamora herself? With a tear into the fabric of reality and a nod to the designs of her adoptive father, we finally see what has been hinted at since the release of the upcoming issue titles: the creation of new heroes, changed in ways unfathomable to any but a certain trickster god who winds up in the wrong story. Gamora/Requiem, still in control of the Infinity Stones, is confronted by Loki who, as he is wont to do, tries to ingratiate himself to the most powerful being in the room. Unfortunately for him, Gamora knows who he is. In this frozen moment of time, we see Gamora continue to unravel, disgusted by what she knows she had to do but, at the same time, desirous to use the Infinity Stones to fix what is wrong. Wrong with her, wrong with the universe. In a truly twisted way, she follows in Thanos’ footsteps and halves the population of the universe. By merging every pair of people into one being. This particular page is going to haunt me. Thanks, Mike Deodato. In this new universe she tosses Loki, eager to see him gone from her version of reality. Quickly, in this weirdly sepia-toned reality, we are introduced to the newest batch of Avengers: The Soldier Supreme, Iron Hammer, Weapon Hex, Arachknight, Ghost Panther, and some unholy and yet intriguing combination of Wolverine and Emma Frost. Writer Gerry Duggan, along with Deodato, has done what many recent comics events have failed to do: come to a point of great change where anything can happen and where there is potential for new characters beyond the arc of the series. Hell yes I want to see Soldier Supreme and Iron Hammer beating up some villains! Who do they get to fight? The Juggernazi? Some kind of Vulture-Scorpion*? The Red Mandarin? I’m all in on this one. If Infinity Wars continues down this path, good things will follow. They must, however, see it through. Making Gamora the baddie immediately was a bold move, but this cannot be another Civil War or Civil War II or name-your-event moment. Follow through on this one and see the story out. I guess it all depends on who is really in control. Whatever happens in the end, though, can we keep Ghost Panther? You got your Super Soldier in my Sorcerer Supreme! ...assuming there is proper follow through.